Hudson featured in Black Enterprise! 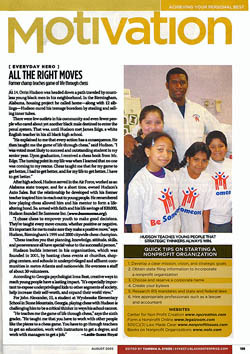 Orrin Hudson was featured on page 159 of the August 2005 issue of Black Enterprise (BE). BE is a popular magazine focusing on economic empowerment, wealth-building and money management. Hudson told The Chess Drum that, "miracles are happening," and bigger things are to come with BeSomeone, Inc.
"The turning point in my life was when I learned that no one was coming to my rescue. Chess taught me that for my game to get better, I had to get better, and for my life to get better, I have to get better." Hudson took his life savings of $20,000 to form BeSomeone, Inc., a non-profit organization designed to reach out to at-risk youth and teaching them the game of life through chess. Black Enterprise runs "All the Right Moves" about Orrin Hudson's BeSomeone, Inc.